The Most Perfect Saturday Ever, by Myles G.
So there I was, surrounded by all these pretty girls, and looking right at a turtle sundae which was about the tenth ice cream treat we'd tasted at the fourth ice cream shop we'd visited that day. How does a fellow get this lucky? And if life is this good at six and a half, what more is there to look forward to? I pondered these philosophical questions for about another half second, and then I dug in. Even if this was our fourth ice cream stop of the day, I knew that in this crowd, you snooze, you lose. And then, as the power of hot fudge and ice cream and candy and root beer and caramels and so on overtook me, I thought back to how this, the best Saturday in the history of the whole universe, started. First we drove down to Flossmoor to the train station which is also a restaurant, which is a great thing because my brother Liam loves trains. It was picked by Sdritz, who was there with her whole family and picked all the places for us to go. This guy, Rene, came off the train and joined us. He and my dad and Hannah and Sophie's dad talked boring stuff about some kind of chicken that got invented at an old restaurant in Chicago. My brother and I colored. Dad's note: After driving down through suburbs I had never been to before, some like Harvey rather desolate-- hey, that must be the Blues Brothers' mall-- others with quite charming and quaint downtowns and Starbuckses, we met up at the Flossmoor Station Brewery, which is actually attached to a working Metra station, unusually for an old train station turned into a restaurant. Good beer, perfectly decent bar food, it laid down a base of real food as we prepared to eat our way through the ice cream parlors of the southeast suburbs. The first time we tried to go to an Italian ice place called Zarlengo's it was still closed, so we had to go to a place that sold sausage and boring stuff like that. Liam kept trying to get an ice cream from the cooler here, I told him he had to wait. Dad's note: this was The Specialty Shop. I got some nice-looking sausage with fennel, the big attraction seemed to be dried fennel sausage in oil. Maybe Rene can report on it later. Finally we got to the Italian ice cream place, Zarlengo's. Dad's note: I have to admit I wasn't blown away by Zarlengo's ices, but they had just opened for the season and maybe when the fruit's better they are too. Sdritz said some of their favorite flavors weren't offered yet. We had chocolate chip (Sdritz's favorite and really good) and chocolate and vanilla with lots of hot fudge on it. Liam licked the hot fudge pourer thing and then my dad dumped the rest of it on one of the sundaes without knowing it. We ate it anyway. When we were done Hannah and Sophie's dad said "Don't you think we need just one more?" I kind of saw his point but the rest of the grownups just looked at him like, you do know we're going to two more entire ice cream places, right? Our next stop was in a strip mall. It was called Cunis Candies. We ate another turtle sundae, another hot fudge sundae and something called New York Cherry. My dad found this article on the wall which not only said New York Cherry was the thing to have but that it was invented in Chicago! For some reason he and the other grownups thought that was real funny and kept saying they couldn't wait to tell Lucantonio's dad about that. Dad's note: Another article on the wall-- Cunis might have the best collection of framed 30-year-old clippings in the Chicago area-- said that the thing to have, when it's in season, is the made-on-premises peach ice cream. We asked the guy working the ice cream counter-- does that make him an actual soda jerk, I wonder?-- when that would be and he said late June, probably. So a return trip will definitely be in order then. Cunis' ice cream was lighter than Mitchell's, the best thing about it I thought was the hot fudge, which was dark chocolate and much less sweet than is typical. We also sent a scout, that is, the Condiment Queen out to a jerk chicken place we saw a block or two away and had some of that while the kids sucked down the ice cream. I missed the name of it, though, maybe someone else can report on that. The last place we had ice cream was called Gayety's. As soon as we walked in this old guy started barking at my dad about where we parked. Once they started asking him about ice cream though he got less grouchy. First we had a hot fudge sundae. Then after they talked to the guy he told them the thing to have was a strawberry ice cream sundae with fresh strawberries and real whipped cream like my dad makes at Thanksgiving. I offered to lick the big mixing bowl of it after but he must not have heard me. Dad's note: Gayety was the most upscale of the places, probably because I believe it moved the most recently. The ice cream was clearly the lowest in butterfat, and oddly a little grainy. It might have been a disappointment by itself, but the freshly whipped real whipping cream added back all the fat we'd seemed to be missing. I thought we'd come out of this competition with a winner and a loser but the fact is, all three had some strong points and were well worth trying. Afterwards we went to this giant, totally packed place called Aurelio's for pizza. We played the videogames and one of those claw things. I got a plastic soldier and a gold coin. We also had one with sausage and hot peppers. Aurelio's is one of those pizzas that's better than the sum of its parts. The crust is kind of odd: a little spongy, like a Pizza Hut pan pizza, but thin crust-flat. (I'm not sure if it's baked on something like a pan because it's actually served on a grate.) The sauce, taken by itself, is a little too sweet, we all agreed. But the toppings were really first-rate-- even the straight cheese pizza, which we got for the kids, had lots of good cheese and seasonings flavor-- and especially when you had the very flavorful Italian sausage, it all came together into a first-rate pie which fully justified both the enormous business they were doing on a Saturday night (probably 150-200 patrons plus a very busy takeout area) and the fact that they have 40-some other outlets. I don't know how the others measure up-- we were not only eating at the original but Sdritz made sure to order ours baked in "the old oven"-- but this was an excellent end to a day of good all-American eating. Thanks to her and her family for arranging it all, keeping us from getting lost in unfamiliar places, and helping us all corral the kids and send 'em home happy and well-fed. 257 W. Joe Orr Rd. What a family fun day! Since you only mentioned Gayety's as having real whipped cream, does it mean the others didn't? I'm somewhat sensitive about ice cream stores who go to great efforts to make their own ice cream, perhaps their own fudge and fruit toppings, then ruin it all by using cheap from-the-can whipped cream. It looks like you all had a marvelous time. Ah, for Dads it was a pretty perfect day as well. If I had posted first (and I am glad I did not, I could not have come close to the above), I would have called the post, ghosts who walk. In some ways, I was a bit sad yesterday. Happy, really, really, reallly happy with what went in my tummy, but a bit sad about the places. Sad because you could tell these places were ancient history. Mitchell's, especially, seemed to be gathering no interest in its superb product, and you know the Cold Stone Creamery goin' up a few doors down will be packed upon opening. And Mr. Gayety, once the initial parking issue was addressed was a charming and sweet as his fare, but you knew he was not exactly in it for another half century. Sad, really because these places seem to me, just terribly un-appreciated. Faced with greatness, the public seems strangely un-impressed. You can imagine a day, when a Saturday afternoon would have seen these places stuffed with people stuffing themselves. Not this Saturday. For the most part, we occupied most of the attention of the staff during our visits. But not us. We were impressed. Very. As Mike notes, there was no loser in the pack. Hard to rate them 1,2,3. Each had little things they did well, better, but in totality, each just plain, well rocked to use that hoary expression. At Mitchell's it was the butterfat in the ice cream and chewy home-made turtles. At Cunis, it was about the best salted pecans imaginable, and the nuts alone about elevated that sundae above the rest. But also the fudge, dark and intense, almost like liquid Vahrona, and also winey I thought. 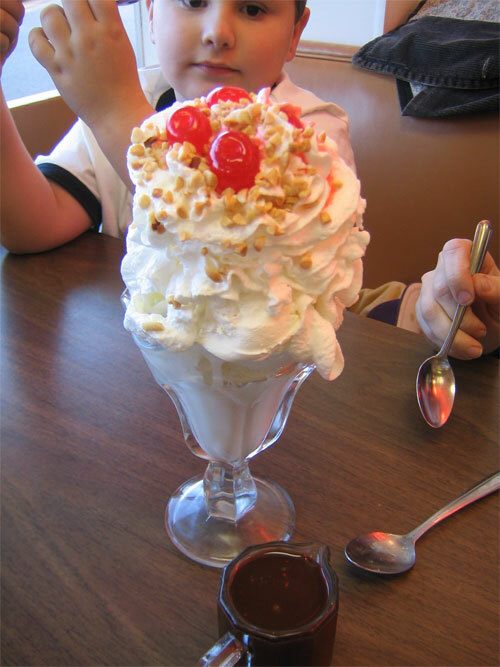 And Gayety, that whipped cream, just the mirth of Mr. Gayety (yes not his real name) as he slouphed it on the giant sundae. Also, perhaps a slightly better caramel sauce. I liked Gayety's ice cream best, its lightness being a benefit. I should also add that Gayety, generously, gave me a complete tour of their candy making operations, including their small I Love Lucy machine. Mike hit the nail on the head with Aurilio's. It was not a pizza of great parts, but in total pretty good. I mean anything we could actually want to eat after all that ice cream and ices* had to be OK (as Ludo Bagman would say). Thanks again to Suzy for both inspiring the outing and arranging the logistics. *I'm not really an ice afficionado, but the canolli ice cream at this place was pretty nice. Thanks for the fabulous report and the great pictures!! My family and I had a great time showing you around the southern suburbs and eating a variety of fabulous items all day. By the way, the name of the jerk chicken place was Buster's. I don't have the exact address, but VI took the carryout menu with him and I'm sure he can provide it. As I mentioned as we were touring, we usually go to Mitchell's for two reasons, first because I grew up on their chocolate chip hot fudge sundaes, and second because we live a block and a half away. I had not been to Cunis Candies in about 30 years, and never tried Gayety's. I especially liked their dark chocolate covered dates. Really, really sweet and really, really good. My family really liked the "new" places we tried and we are ready and willing to host a fresh peach ice cream a-thon as soon as peaches are in season!! Great writing job Myles. In some respects you write even better than your dad. Your descriptions make me want to drive to Chicago tonight. Even though it is almost bedtime. I'm desparate for some ice cream now. As a party came in behind us at Cunis I heard someone say "It's never this crowded." Sadly true, I suspect. Well, in the interest of luring a few more folks down for ice cream I made a quickie map. Since I think this is a section of the city pretty unfamiliar to most people who don't come from it in the first place, and I certainly had no idea before I went whether they were upscale burbs or bombed-out slums (as it turned out, we passed through the bombed-out slums to find a number of very pleasant towns with more than a few upscale developments scattered about), I think a map might help others place where we went in a context and see that all these spots are very reachable by car-- about the same distance from downtown as, say, O'Hare. Map altered per Sdritz's correction below. P.S. To Cathy's question-- the Gayety whipped cream was definitely better, by far, than the others and we saw it being made (or at least being cleaned up after). My assumption about the others was that it wasn't freshly made, I believe that's pretty rare these days, but I can't swear to it. One more thing about Cunis that was nice-- the chips in the chocolate chip were big and bitter. I liked that a lot. Last edited by Mike G on May 1st, 2005, 8:54 pm, edited 1 time in total. The map is great, Mike, but The Speciality Shop and Zarlengo's are in Chicago Heights, on the other side of Homewood and Flossmoor. While we have purchased the dried sausage before, we never tried the fennel. It's delicious, and our jar is shrinking rapidly. Randy compared the hot dried sausage to a pepperoni flavor. I think fennel may become my new favorite. The kids think it looks and smells disgusting and won't go near it. Good. More for us! I will also add that for years we have been hearing people say, "Oh, you live in Homewood? That's so far. It's much better if you come and meet us in the city (or the northern suburbs, or wherever)." It's not that bad of a drive -- you can get to Homewood via the Tri-State, I-57 or the Calumet Expressway. We are always happy to show off our local specialties to anyone interested enough to make the drive. Last edited by sdritz on May 1st, 2005, 8:15 pm, edited 1 time in total. Cathy2 wrote: Since you only mentioned Gayety's as having real whipped cream, does it mean the others didn't? I'm somewhat sensitive about ice cream stores who go to great efforts to make their own ice cream, perhaps their own fudge and fruit toppings, then ruin it all by using cheap from-the-can whipped cream. The whipped cream at Mitchell’s and Cunis was pretty good but Gayety’s was better. Gayety’s ice cream seemed sweeter and slightly less rich to me (it’s 14% butterfat). Their hot fudge sundae, while very good, was probably third best of the day. I loved the fresh strawberry sundae though. Maybe it’s not as pretty as some others (no garnishes) but the flavor was sure there. Fresh strawberries and just-whipped cream were the highlights. They take their whipped cream seriously at Gayety. This bowl is resting on some of their freshly made fruit sauces. I think that’s tutti-fruity barely visible in the right rear. The original Gayety Ice Cream Parlor opened in 1920 on S Commercial near 92nd (now a McDonald’s). This mixer, still in daily use, is from that time. They start with 36% butterfat cream and whip it as needed. This was a fun day. I generally don’t get very excited about ice cream but these places are special. Probably any one of them is better than any store presently in Chicago. sdritz wrote: While we have purchased the dried sausage before, we never tried the fennel. It's delicious, and our jar is shrinking rapidly. Randy compared the hot dried sausage to a pepperoni flavor. I think fennel may become my new favorite. The kids think it looks and smells disgusting and won't go near it. I’ve already started in on my sausage-in-a-jar and am enjoying it greatly. Is this spianata calabrese? Whatever it’s called it’s very tasty. Spicy but not overdone, with a nice slightly fermented taste. I didn’t care for this particular bread from Marconi’s as much as I’d hoped (I failed to read the ingredients—vegetable shortening). Marconi’s has been in business since 1911 and I’d happily try some of their other breads. sdritz wrote: "Oh, you live in Homewood? That's so far. It's much better if you come and meet us in the city (or the northern suburbs, or wherever)." It's not that bad of a drive . . .
Also, it’s very easy to get to by train. Mitchell’s is a very short walk from the Homewood stop (Metra Electric) and Flossmoor Station (best beer in the Chicago area) is quite literally right at the Flossmoor station. Thanks so much for showing us around. I can hardly wait for the peach ice cream season to begin. Rene G wrote: I didn’t care for this particular bread from Marconi’s as much as I’d hoped (I failed to read the ingredients—vegetable shortening). Marconi’s has been in business since 1911 and I’d happily try some of their other breads. I imagine the fact that "shortening" is the most clearly legible word in the frame was intentional on your part. Rene G wrote: This was a fun day. I generally don’t get very excited about ice cream but these places are special. Probably any one of them is better than any store presently in Chicago. This NO WAY a knock on any of the places from Saturday, but I would offer, IMHO at least, that Margies on Western/Armitage/Milwaukee is comparable. Perhaps ice cream not as good, but Margie's hot fudge is near the top. I still swoon though when I look at the pictures above. I might make this thread my home page and ReneG's picture of the strawberry sundae* my screen saver. *NB on the sundae. If this matters, the strawberrys were fresh (very), but they were in a syrup. I liked them that way (a lot), but if you are expecting a more "pure" taste, forgot it. 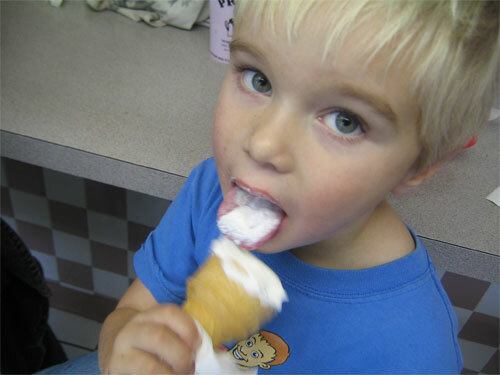 We didn't set out to add an addendum to the earlier south side ice cream reports. Looking for something to do on a (just barely) nice fall day, we wound up at The Little Red Schoolhouse, one of the Cook County forest preserve nature centers. 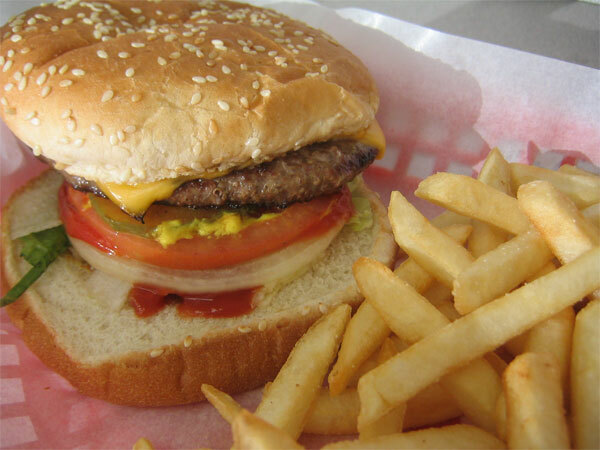 Having exhausted it, and being in Willow Springs, wherever that is, I quickly ran through my mental map and produced Top Notch Beefburger as a logical place for lunch. Which it would have been... if it wasn't closed on Sundays. 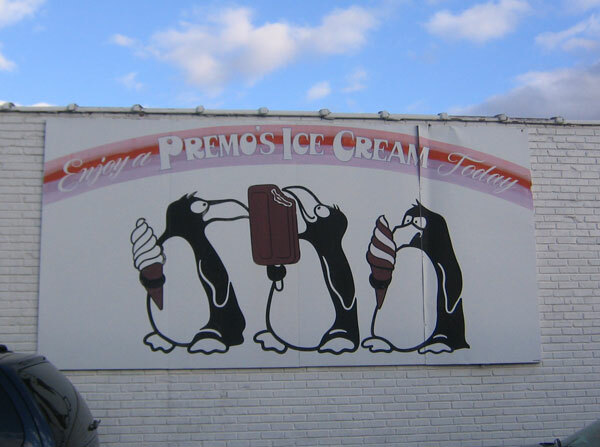 Driving around looking for somewhere else to go on 95th street, we found Premo's. Where we had a perfectly respectable, nothing to write home about or drive more than a mile or two out of your way for, bunch of burgers and dogs. Waiting for them, however, we looked around the clippings and photos on the walls. A montage on one wall revealed that Premo's had had an earlier existence, so far as I could tell in this same building, as a 50s burger stand called Zales, and whatever the reason for the name change over the years, the custard seemed to be claiming to be unchanged. Next I read a Chicago Parent article on the wall which mentioned Mitchell's, above, as well as Premo's itself which, it said, was home of the best custard on the southwest side. Not being able to think of any other custard on the southwest side, I had little basis for evaluating the claim-- other than, of course, ordering some. Don't forget the eyes! a sign on the wall admonished. 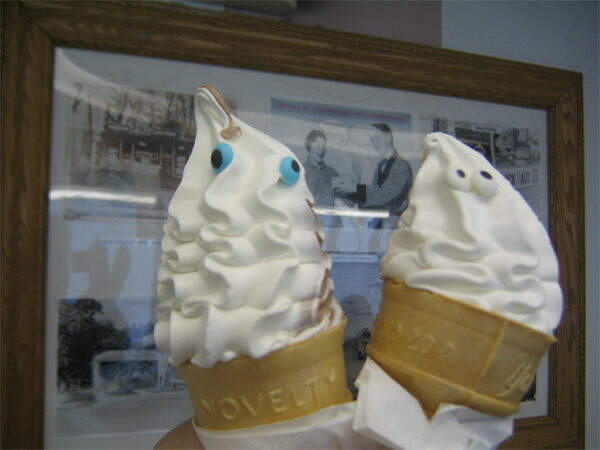 Yes, the custard at Premo's has eyes. For children who had grown up on the legend of Gary eating an eyeball taco, this was a discovery of almost boundless delight. So how was it? I am perfectly prepared to believe that it is indeed the best custard on the southwest side, indeed possibly better than anywhere in Chicago other than Scooter's. No chemical flavors or odd graininess, rich and real if not quite Kopp's-level vanilla and chocolate flavors, smooth and butterfatty, it can be recommended wholeheartedly if you're anywhere even remotely nearby (e.g., Chuck's once it reopens). Premo's custard is, well, primo stuff-- for Chicago, at least. They also have a variety of homemade frozen treats of the Dairy Queen sort in a freezer case, including frozen chocolate bananas. ...and good thing it wasn't too large for us! 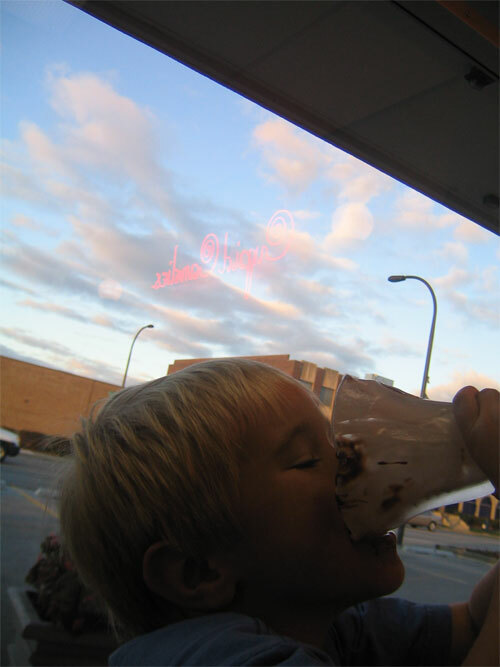 In any case the kids liked it, in fact Liam liked it so much that he had a psychic episode and, as you can see, mentally projected the store's logo (in reverse) into the very heavens above. Now that's good hot fudge. strangely missing from these reviews is Rainbow cone...i seem to remember it being way down south on harlem. It may not be cutting edge, but it sure is a slice of history. There is a Rainbow Cone just off Harlem in Orland Park, though I've not been there and have no idea of its relationship to the Western Ave location.